... Avengers Assemble, by Brian Michael Bendis, Mark Bagley, and many more. 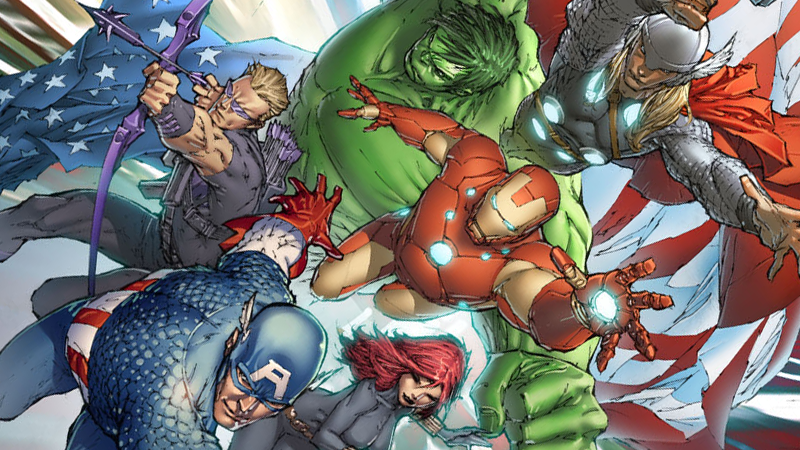 Although by the end of its run last year the comic was in a very different place to where it started, originally Avengers Assemble was heavily marketed and designed as a movie fans’ introduction to the world of Marvel comics. Released just in time for the debut of the first Avengers team-up film, the book started out with an Avengers team identical to the movie: Captain America, Iron Man, Black Widow, Hulk, Thor, and Hawkeye. It even very quickly started dealing with Thanos, who’s being built as the ultimate big-bad of the MCU before he finally faces the Avengers in Infinity War in 2017. With Bendis on scripting initially, the dialogue has the same sort of naturalistic snappy banter you’d experienced in the Whedon movie—this was essentially the perfect stepping-on point for movie fans. Want something a bit different? Try The Ultimates, by Mark Millar and Bryan Hitch. Set in a popular alternate imagining of the Marvel Universe known as the “Ultimate Universe,” this 13-issue miniseries reworked the Avengers—dubbed the Ultimates—for the modern day, and paired the heroes back into something similar to their original origins. The Ultimates has been a huge inspiration for Marvel’s movies, both in plot (the first Avengers film is pretty much a retelling of the comic’s climactic battle with the Chitauri) and their general approach to the characters. Avengers Assemble may have been inspired by the movies, but the movies were inspired by The Ultimates. But part of loving the Avengers also comes from having an interest in the individual members that make the team. Here’s a few suggestions for character-specific books that have the same tone as the characters in their standalone movies. Before he became the global superstar of the Marvel Cinematic Universe, he was kind of a B-list hero at Marvel, although that’s hardly indicative of the quality of the comics. Invincible Iron Man: Extremis, by Warren Ellis and Adi Granov, is essential reading. The opening of a new reworking of Tony in 2005, Ellis and Granov’s take on the Iron Avenger updated his origin story to the story that would eventually be used in Iron Man in 2008, and introduced the Extremis virus, which would go on to be a major thorn in Tony’s side in the comics and played a part in Iron Man 3. Even visually, Granov’s work was a big influence on the aesthetic of the first film—he was credited for helping to design the original Iron Man suit in 2008, based off his Invincible Iron Man work. If you;d like something that feels even more like Robert Downey Jr.’s take on Tony Stark, you might want to try the current incarnation of Invincible Iron Man, by Brian Michael Bendis and David Marquez. Relaunched just a few months ago as part of Marvel’s ongoing “All-New, All-Different” reboot, the Tony of this book takes a lot of inspiration from Downey Jr., and once again Bendis’ knack for extensive dialogue makes it feel very much in line with the MCU’s take on the character. Black Widow has had a few series in the wake of her importance in the MCU, but if you want definitive spy stories from the world of Marvel in the vein of her damaged, darker background in the movies, Black Widow: Homecoming, by Richard Morgan, Bill Sienkiewicz and Goran Parlov, is a must. The story delves into Natasha’s past and is a truly engaging spy thriller, one that places Widow as the star rather than just an ancillary supporting character—and approaches her history as a “Femme Fatale” in a tasteful and well-done manner. Captain America: Winter Soldier, by Ed Brubaker and Steve Epting, is considered to be one of the finest runs on the character in Steve Rogers’ entire history. It’s a fantastic story that is famous for the re-emergence of Bucky Barnes as the titular Winter Soldier, and if you follow the whole series to its conclusion, gives a great insight into one of the biggest influences on the Captain America movies in terms of tone and approach. If you like the political undercurrents of The Winter Soldier movie ,though, you might also want to try out All-New Captain America and Sam Wilson: Captain America, by Remender and Stuart Immonen, and Nick Spencer and Daniel Acuna, respectively. These recent Captain America series star Sam Wilson, who MCU fans will know as Cap’s friend Falcon, as the new man behind the shield. While it’s not typically close to the movies as they are now, both of Sam’s series so far have dealt with an uneasy relationship with SHIELD, and a political bent that is very much in line with the Steve Rogers of the movies. Clint Barton might get short shrift in the movies, but that’s totally not the case in the comics. Launched to put eyes on the character during the run up to the Avengers film in 2012, Hawkeye by Matt Fraction and David Aja is hands down one of the greatest comics Marvel has put out as a company in recent history. Depicting a Hawkeye (and his best friend/fellow Hawkeye, the fabulous Kate Bishop) away from the Avengers but trying to abide by the heroic codes they rubbed off on him, this is a modern take on a character that most people dismiss as “that guy with the bow.” Sure, he is a guy with a bow, but he’s a fantastically funny and engaging one in this series. A darker tale rather than the typically more fantastical bent that befits the Thor movie series, Thor: God of Thunder, by Jason Aaron and Esad Ribic sees the Odinson do battle with a far more intriguing and compelling version of Malekith than the one featured in his sophomore movie The Dark World. It moves on to more fantastical tales of godhood and Asgardian drama, but continues to focus on Thor and his world, rather than Thor dealing with the problems of Earth, a vibe that very much sits in line with the character’s solo movies. I’m going to suggest a bizarre story for Hulk. It’s not a particularly simple entry to the character—it has a lot of context wrapped up in other comics that might confuse and alienate a new reader. But if you’re a diehard MCU follower, you’ve heard the name of this story whispered in spoiler-y speculation for years at this point: Planet Hulk, by by Greg Pak and Carlo Pagulayan. This epic saw a team of superintelligent heroes acting behind the scenes as an organization dubbed “The Illuminati” send Hulk into space, thinking it would keep the wild and angry creature from causing collateral damage on Earth. Instead, Hulk becomes a gladiatorial fighter on an alien world and examines its relationship with Bruce Banner, and eventually comes back to Earth angrier than ever. But it’s so familiar to fans because the age old rumor of a Planet Hulk adaptation—or a framework that would allow the character to leave the Avengers and crossover to a movie like Guardians of the Galaxy has been speculated about pretty much since the climax of the first Avengers film. You might as well see what the fuss is about. ... Guardians of the Galaxy, by Dan Abnett, Andy Lanning, and Paul Pelletier. Admittedly, the movie doesn’t really share much in common with this series other than the basic framework of the Guardians team itself. If you want something more directly linked to the success of the film (almost a little too linked) you might prefer Brian Michael Bendis, Steve McNiven, and Sara Pichelli’s Guardians of the Galaxy: Cosmic Avengers or Legendary Star-Lord by Sam Humprhies and Paco Medina. But Abnett and Lanning’s revival of the Guardians in 2008 is a fantastic Marvel cosmic book that reignited that subsection of the Marvel universe in a way that made it popular enough for the MCU to expand to it with a Guardians film. It was the first time these now-household names were teamed together, and laid a lot of foundations that would go on to inspire the film. Ant-Man, by Nick Spencer and Ramon Rosanas. Beginning a year before Ant-Man hit theaters, this series, following Scott Lang as Ant-Man, was essentially designed to recent the character to something in line with the approach that would be found in the film. It’s a fantastic primer in that regard, and it’s a funny and very sweet superhero book that delves a lot into Scott Lang beyond being a bit of a goofball. If you like it, the series continued as The Astonishing Ant-Man in October with the same creative team, following Marvel’s “All-New, All-Different” reboot. ... SHIELD, by Mark Waid and Carlos Pecheco, Daredevil: Man Without Fear, by Frank Miller and John Romita Jr. and Alias, by Brian Michael Bendis and Michael Gaydos. Marvel aren’t just making big waves at theaters, but on the small screen, too. The influences for the Netflix shows Daredevil and Jessica Jones have strong roots in the comics—Man without Fear was Frank Miller’s definitive retelling of Matt Murdock’s origin and served as a strong basis for the show, right down to the “ninja” look Matt wore for much of the first season. Alias was slightly rooted in the world of superheroes more that Jessica Jones was, but it still served as the groundwork for the series’ main arc dealing with the traumatic fallout of Jessica Jones’ encounters with the Purple Man, and is a stunningly adult comic experience that the show’s tone has much to thank for. SHIELD is the best of both worlds for Agents of SHIELD fans. Featuring direct crossovers of Coulson, Melinda May, Fitz, and Simmons (as well as the comic versions of Bobbi and Daisy), it’s a secret agent spectacle but, unlike the show, free to root itself as closely as it can to the biggest heroes of the Marvel universe. Imagine if Agents of SHIELD had an unlimited budget and access to the same playground as the Marvel films, and SHIELD is pretty much the result. Don’t... read the MCU tie-in comics. You might think a simpler answer to all this is to read some of the myriad prelude comics created to directly tie into the Marvel movies. Not only is this a bad idea because very few of them are truly great comics, but it’s also limiting yourself to something you can already experience a much better version of in the films and TV shows. If you want to use a love of the MCU as an entry to comics in general, these aren’t the best start. Do... use the MCU as a stepping stone into wider comic reading. After you’ve gotten more and more into the world of comics, it’s natural that if you want to branch out, you can start dipping into other issues and series that take your fancy. It could be more Marvel. It could be DC. It could be anything you want, not even just superhero comics. Your love of the films could be a gateway into another vast hobby that you’ll love, if you want it to be. Don’t... read the comics that gave the films their titles. As well as those tie-in comics, you might think it’s natural to try and go for comic arcs that the movies take their titles from—like Age of Ultron, or the upcoming Civil War. This is a very bad idea, as those series are completely different to the movies you’re familiar with, and wrapped up in reams of complicated comic book continuity that will probably put you off rather than pull you in (especially Age of Ultron, a time-travel mess of a story deeply rooted in classic Ultron stories and connections). The Winter Soldier is an exception, not the rule. Do... have fun with it. Reading comics can seem insanely intimidating at first. There’s so much background and material that you might think that sticking to the movies will be your best bet at getting a Marvel fix. It might be, in the end—you might not find that comics are for you. That’s okay! But give them a chance, and with a few tips and tricks, you can have some fun with diving into something new and exciting that might make you an avid reader.